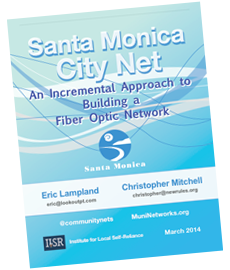 Santa Monica has built a fiber network called City Net that has lowered its own costs for telecommunications, helped to retain businesses, and attracted new businesses to the community. Built incrementally without debt, it offers a roadmap any community can draw lessons from. Unlike the majority of municipal fiber networks, Santa Monica does not have a municipal power provider – City Net is run out of the Information Systems Department. The vision for the network and its expansion was created in the Telecommunications Master Plan in 1998, standardizing the procedure that we now call “dig once.” Careful mapping and clever foresight laid the foundation for growth. This report is the first of two. 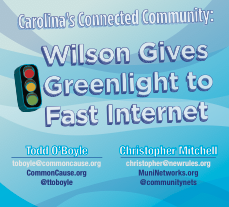 The second will be published shortly and will feature a discussion of how Time Warner Cable reacted, pushing legislation through the General Assembly to block other communities from copying Wilson's success. We have just released a paper revealing how Martin County saved millions of dollars by building its own fiber optic network to link schools and county facilities rather than leasing lines from Comcast. 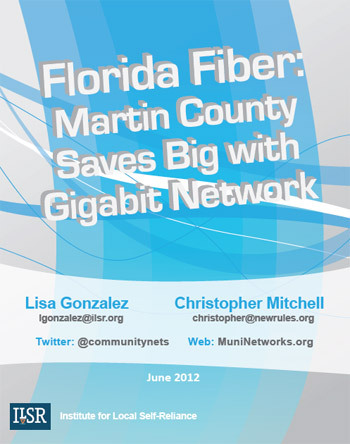 The report, Florida Fiber: Martin County Saves Big with Gigabit Network, reveals how Martin County transformed the threat of a near ten-fold cost increase for its telecom budget into cost savings and new opportunities for economic growth. Download the Florida Fiber Report here. 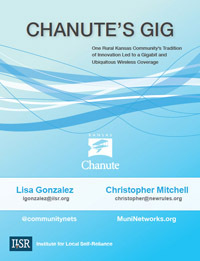 ILSR Broadband Researcher Lisa Gonzalez and Christopher Mitchell authored the report. The new report highlights challenges the County faced, creative tactics used to reduce the cost of the investment, financial details on the incredible cost savings from the network, and how the new connections are already being used. Though the County is not planning on offering services directly to residents or businesses over the network, the network has already allowed a local Internet Service Provider to expand its territory and offer some choices to people and businesses previously stuck only with AT&T and Comcast. Additionally, the network is leasing dark fiber to some entities. Florida law makes it difficult for the community to offer services to residents and businesses by imposing additional regulations on public providers that are not imposed on massive companies like AT&T and Comcast. If you want to stay current with stories like this, you can subscribe to a once-per-week email with stories about community broadband networks. In a report entitled "Universities as Hubs for Next-Generation Networks," the Open Technology Initiative at the New America Foundation has explored a new path for expanding community networks. The full report is available here [pdf]. This report builds on the Gig.U initiative, in which major universities are working with communities and other partners to expand access to next-generation networks in select areas. We recently wrote about a Gig.U project in Maine. This approach encourages a very collaborative approach with lots of community input and a mix of fiber-optic lines feeding neighborhood wireless networks. Universities already need robust connections but few have been as bold as Case Western Reserve University, which initiated a project to share a gig with neighbors in Cleveland. 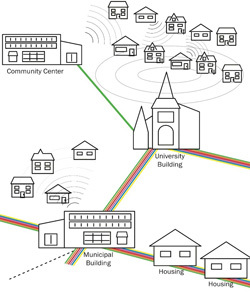 OTI calls on open access fiber links connecting anchor institutions that allow wireless nodes to easily connect. Planning for such interconnection upfront is far preferable to adding it after because interconnection points should be placed in convenient places for wireless transmitters. Moreover, communities deploying wireless mesh technology can incorporate additional service offerings into their networks. Mesh facilitates the use of a community-wide intranet, allowing all users connected to the mesh to access content and applications from local schools, universities, libraries, religious establishments, social service agencies, local governments, and local anchor institutions. To the extent that each of these components is also connected to the mesh, the intranet component of the network would be functional even without Internet backhaul connectivity, and might actually run faster than Internet connections. We are thrilled to finally unveil our latest white paper: Broadband At the Speed of Light: How Three Communities Built Next-Generation Networks. This report was a joint effort of the Institute for Local Self-Reliance and the Benton Foundation. Chattanooga, Tennessee, is well known for being the first community with citywide access to a “gig,” or the fastest residential connections to the Internet available nationally. Less known are Bristol, Virginia, and Lafayette, Louisiana – both of which now also offer a gigabit throughout the community. A new report just released by the Institute for Local Self-Reliance (ILSR) and the Benton Foundation explains how these communities have built some of the best broadband networks in the nation. Broadband At the Speed of Light: How Three Communities Built Next-Generation Networks is available here. Mitchell is a national expert on community broadband networks and was recently named a “Top 25 Doer, Dreamer, and Driver” by Government Technology. He also regularly authors articles at MuniNetworks.org. 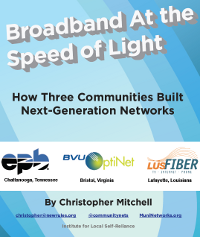 The new report offers in-depth case studies of BVU Authority’s OptiNet in Bristol, Virginia; EPB Fiber in Chattanooga, Tennessee; and LUS Fiber in Lafayette, Louisiana. Each network was built and is operated by a public power utility. Broadband At the Speed of Light: How Three Communities Built Next-Generation Networks is available here. About ILSR: Institute for Local Self-Reliance (ILSR) proposes a set of new rules that builds community by supporting humanly scaled politics and economics. The Telecommunications as Commons Initiative believes that telecommunications networks are essential infrastructure and should be accountable to residents and local businesses. About Benton: The Benton Foundation works to ensure that media and telecommunications serve the public interest and enhance our democracy. We pursue this mission by seeking policy solutions that support the values of access, diversity and equity, and by demonstrating the value of media and telecommunications for improving the quality of life for all. In little more than a year, Burlington Telecom went from being a hopeful star of the community fiber network movement to an albatross around its neck. 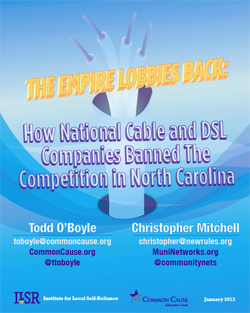 The controversies surrounding it have encouraged cable and telephone companies to use it as Exhibit A in their case against communities going into the telecommunications business. However, most of those criticizing Burlington Telecom have very little understanding of what went wrong and how it happened. Examining what actually happened helps to explain how these problems may be avoided, as the vast majority of existing community networks have already done. 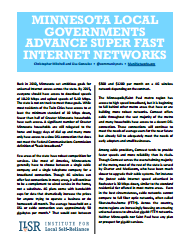 In 2007, ILSR issued a case study on Burlington Telecom. The report argued that Burlington Telecom was a model for how communities could build their own next‐generation fiber‐to-the‐home broadband networks. This report revisits and updates that report, analyzes Burlington Telecom’s situation (for better and for worse), and extracts useful lessons for other communities pursuing community fiber networks. In preparation for this report, ILSR examined many documents, including those available due to the investigation of Vermont’s Department of Public Service. We interviewed many people from Burlington, including former BT employees, citizens active around the project, and City Council members. We discussed Burlington’s situation with a number of others intimately involved in community broadband networks around the country and posed questions directly to a representative of BT.